There are a lot of stereotypes about ISFJs that perpetuate in the type community. Some of them are nice; “ISFJs are super sweet and compassionate”, “ISFJs are amazing bakers!”, “ISFJs make great parents!”…other stereotypes aren’t so nice. I’ve heard people say that ISFJs are pushovers or mindless rule-followers (extremely untrue). Unfortunately many type descriptions don’t reveal the depth and beauty of this type, so this article is one step in my effort to shine more light on this incredible personality type. ISFJs have a strong awareness of cause and effect and they hold tightly to lessons they’ve learned through personal experience. When something goes wrong one time, they know how to sidestep that the next time the situation presents itself. They are unlikely to keep repeating the same mistakes over and over and are very practical about finding solutions to problems. Your whole life is composed of a beautiful repertoire of memories and impressions that play effortlessly through your mind. When it’s autumn, the smell of pumpkin pie transports you to memories of childhood Thanksgivings and afternoons spent in the chilly air searching for just the right pumpkin. When it’s December, that first whiff of a wood-burning fire mixed with the crisp breeze reminds you of the glittering, moonlit nights you spent staring out your bedroom window at the blanket of freshly-fallen snow. Everything you see is connected to something else and you enjoy being able to recreate traditions to keep those memories alive and sparkling before your mind’s eye. When someone or something is important to you, you make a mental note (without even trying) to remember all the details about that person or experience. You can astound people when an experience is mentioned 10 years later and you still remember every detail with startling and vivid accuracy. You’re very aware of change and when something doesn’t follow a similar pattern to what it did in the past. You’ll notice when something is out of place, when someone’s demeanor shifts, when a step is missing from a set of instructions. You pick up on these little changes long before many other types do. Sure, you’re an introvert, but when you’re in a group setting you keep an eye out for people who seem like outsiders. You try to get them involved or make them feel “at home”. You might ask questions like, “What do you think of this?” or introduce yourself and smile at them. You are eager to make sure everyone around you feels comfortable and accepted. You believe it’s your responsibility to make your home or community a better place. ISFJ teachers and parents often recall moments of “burnout” when they realized they had put so much work into their children or students that they forgot to get rest, to recharge, or to do things that made them personally happy and relaxed. The harmony and happiness of others is extremely important to you, but don’t forget that you also matter! Thanks to your tertiary Introverted Thinking (Ti), you sometimes find it relaxing and rejuvenating to play a mind-bending game or learn a bunch of facts about a particular interest. You might enjoy categorizing a system of how everything works and is connected to everything else. You enjoy thinking of the precise, most accurate words you can use to use to describe something and you enjoy using this precision in your personal writing, your relationships, and your career. You’re highly empathetic and concerned with the emotional well-being of the people around you. You try to tune into how they feel so that you can encourage and uplift them. Sometimes this comes at a cost, though, and you may find yourself “over-empathizing” and taking on too many of other people’s emotions and struggles. It’s important to get some time alone to recover from especially tumultuous emotions. You see all these memes and quotes about being an introvert and hating the human race and you can’t 100% relate. You care deeply about people. Yes, you definitely crave your alone time, and yes, sometimes you prefer a text to a phone call…but you have a drive to connect deeply with others and share common joys and camaraderie. You just need some time to recharge afterwards! You might appear quiet and composed on the outside, while inside you are extremely alert and active, trying to solve a problem or grapple with an intense emotion. You can be experiencing intense inner turmoil or fighting an inner argument between your feelings and your sense of logic, but on the outside you might look completely calm. Do you relate to these things? 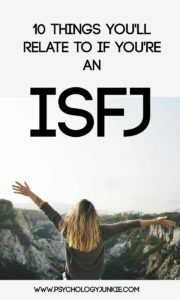 Do you have any other ISFJ traits you’d like to share? Let us know in the comments! This is so sick! You hit the target with this. Hands down it’s the story of my life. Good article. #3 is so true people are often shocked at the many random things I remember about them. It’s that Dominant Si at its best! Thanks! Yes, dominant Si is incredible that way!! Good article I really related to #3 so well I oftentimes stun people with how many facts and details I can remember about people, things, or places. When I go to place I have been to before I’m able to recall past memories of being there, what we did, how much fun I had, and so many more sense impressions. It’s that superhero Si dom. Omg I can totally relate to this.. it’s seems like this article is meant for me :* so accurate..